Squash, a game of strategy and endurance, is played with a racket and a round ball in a four-walled rectangular court. Players attempt to hit a small synthetic rubber ball in such a manner that their opponent cannot return it. Invented in England early in the 19th century, squash came to North America in 1885. English-speaking countries have tended to dominate championship play. 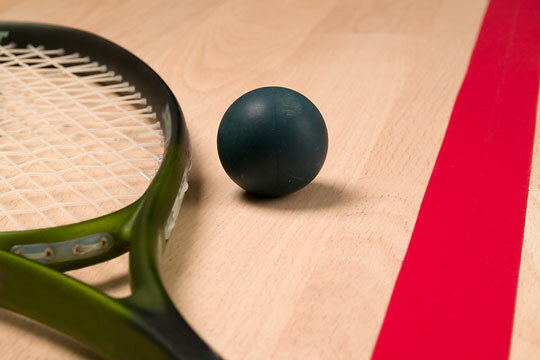 Historically, from the 1930s through the 1980s, squash racket frames were made from glued wood, and had a fairly small round head, but modern racket frames are made from graphite composites, and they have larger heads with synthetic strings. These rackets offer greater hitting power and a larger "sweet spot" than the older style rackets. Hollow, rubber squash balls weigh 24 grams and measure between 40 to 45 millimeters in diameter. Blue dots designate "high-bounce" training balls; yellow dots designate "low-bounce" competition balls. Squash shoes have a light-colored sole to avoid scuffing the floor of the court; some players wear protective goggles. Ohio-based squash Pro Shop has a large selection of squash racquets, footwear, apparel and accessories available at discount prices. This manufacturer of sports equipment focuses on making technologically advanced products which help the average squash player play better. This manufacturer of racquet equipment features squash racquets, balls, grips, apparel and accessories. This racquet sports equipment manufacturer offers a line of squash racquets, strings, grips and bags. Colorado-based producer of quality equipment designed and used by squash professionals, including racquets, accessories and apparel.